Veterinarian Geneva Novak understands the behavior of umpteen species—just not her mother, Helen. Geneva fled her childhood home—and her mother’s vodka-fueled disasters—without a backward glance. Twenty-five years later, Helen totals her car and her leg, and none of her children will play nurse. Geneva’s husband, whose family lives in each other’s pockets, convinces her that letting Helen move in might repair the mother-daughter relationship. Geneva’s not holding her breath. But she recognizes an opportunity. With her mother dependent and hobbled, Geneva may finally get answers to questions that have plagued her for years: why her eldest sister exiled herself to Africa, why her mother won’t discuss Geneva’s long-dead father, and why—there has to be a reason—Helen treats alcohol like a general anesthetic. Sonja Yoerg grew up in Stowe, Vermont, where she financed her college education by waitressing at the Trapp Family Lodge. She earned her Ph.D. in Biological Psychology from the University of California at Berkeley, and studied learning in blue jays, kangaroo rats and spotted hyenas, among other species. Her non-fiction book about animal intelligence, Clever as a Fox (Bloomsbury USA) was published in 2001. While her two daughters were young, Sonja taught in their schools in California. Now that they are in college, she writes full-time. She currently lives in the Shenandoah Valley of Virginia with her husband. 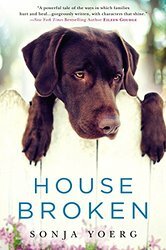 HOUSE BROKEN is her first novel. When Sonja Yoerg contacted me through this blog, asking if I’d read and review her book, I leaped at the chance. After all, I work in rescue, so I’m always up for reading about any character who works with animals. I’m really glad I accepted her offer, because House Broken is a wonderful book. The main character, Geneva, is a veterinarian who clearly cares about her patients and their human companions, but, like many women who work in ‘caring’ professions, she has a hard time prioritizing her own self-care, and the needs of her family. While much of this novel is centered around Geneva’s relationship with her injured mother, I really liked that we got to see the whole picture of her life with its flaws and imperfections as well as its joys. The mother-daughter dynamic was captured particularly well. Even those of us who, like me, have really strong relationships with our mothers, have still had to navigate tricky passages of our lives. I’m very fortunate that my own mother is hale and hearty, but having watched my mother deal with my grandmother’s recuperation from a hip replacement, decades ago, I know about the family secrets, bitter truths, and too-candid opinions that tend to surface during challenging times. Helen, Geneva’s mother in the story, is a character made much more complicated by her love of vodka, because you never know if what she says is meant, or is enhanced by alcohol (or the lack of same). What is especially poignant is the realization that these women love each other, but they don’t really like each other very much. One thing I really appreciated was that we saw Geneva not just as a daughter, but also as a mother. Her own relationship with her children is both counterpoint and learning opportunity, and seeing the ‘whole picture’ of her life made the whole novel that much more compelling. With House Broken, Sonja Yoerg has given readers a meaty, interesting family drama, with the perfect balance of conventional relationships, and unconventional twists to them. Buy this book for the cute dog on the cover, but read it for the amazing story inside. Goes well with Strong coffee and an ‘everything’ bagel, toasted, with sun-dried tomato cream cheese. 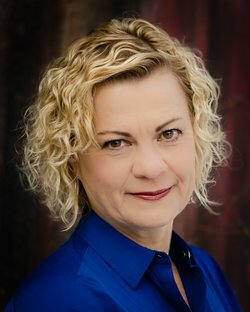 House Broken by Sonja Yoerg (@sonjayoerg) – #Review #Bibliotica by Melissa Bartell is licensed under a Creative Commons Attribution-NonCommercial-ShareAlike 4.0 International License.